Nicknames "El Luchador mas elegante de la Lucha Libre", "Mr. Elegancia"
A tecnico protege of Super Muñeco. 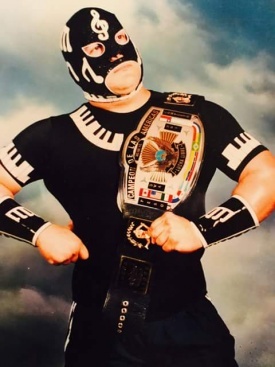 Combined his biggest passions of Lucha Libre and music. His mask design was inspired by the one worn by El Matemático. 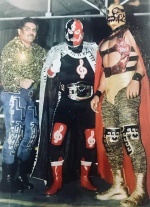 His debut was on April 30,1990 at Auditorio de Tijuana. His tag team partners were Ultraman Jr., Ultra Taro & Medico Asesino against Huichol, Genghis Khan & Ranger de Texas. 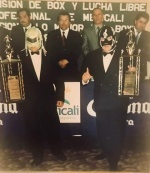 Rafael Rebelin Cup won in the first cage match in Mexicali winning also the mask of Black Bull.